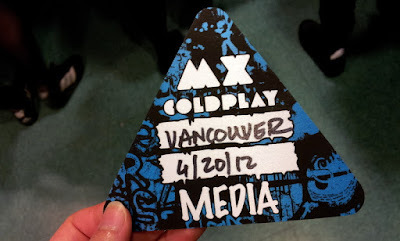 Last Friday, I got a chance to go see Coldplay in concert at Rogers Arena courtesy of Dose.ca! 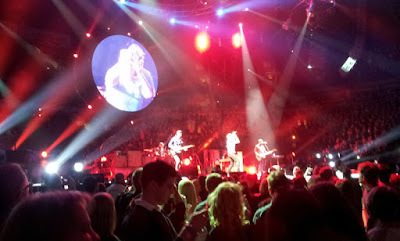 I had the most amazing seats - 4th row on the floor; so close to the stage, that I could practically touch it! And the music just vibrates through my body, especially with the base drum, I could feel my heart jump! 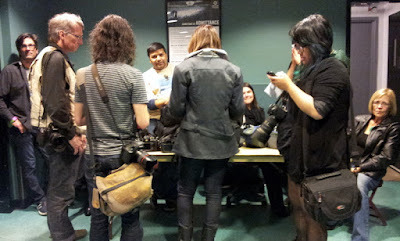 I missed most of the opening act because I was acting as a press photographer for Dose.ca! Unfortunately, I had to sign a waiver saying that only Dose.ca company can post the photos on their website so I'm not allowed to post any of the photos I took while I was a "press photographer" on my blog...though I can post it on my personal Facebook page. Most of these photos were taken by Seapotato on my Lumix camera or on my phone camera. I was working with the big leagues! These are photographers from the Georgia Straight, Vancouver Sun, Province, etc.! I was so envious of their equipment! Most had huge lenses and multiple cameras! For the first three songs I was at the side of the stage photographing the band with the other photographers. They worked frantically trying to get the perfect shots. And just like that it was over and I went back to my seat. You can look at my top photos on Dose.ca. 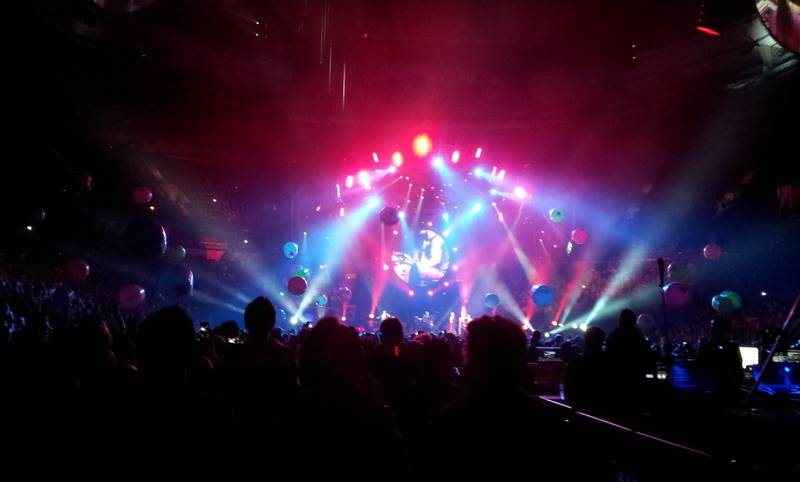 Coldplay loves everything that is glowing! 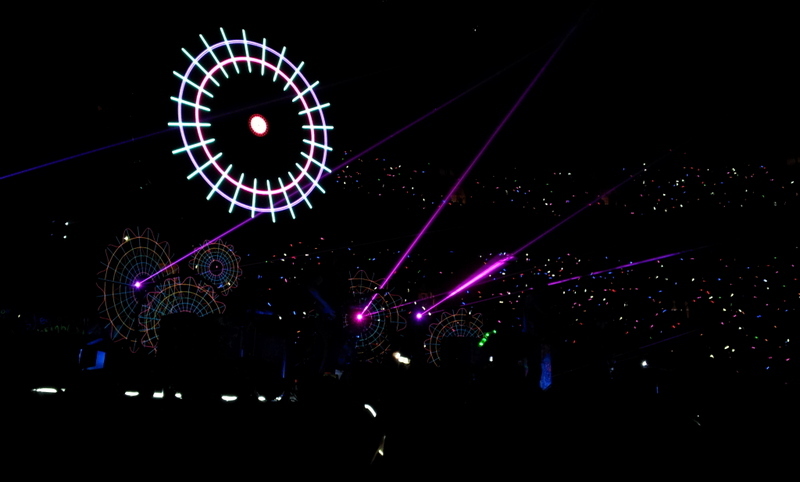 Everything during the concert was either glow-in-the-dark or lit up with lights or lasers. Coldplay also loves their confetti. The confetti machines were working overdrive! There was so much that everything was covered in a thick layer by the end of the night! There were also balloon balls that were dropped from the rafters that were filled with confetti so when people popped them they showered the person with more confetti! Oh my! An entire forest levelled all in the name of entertainment. We were given these bracelet things when we first went in and they didn't tell us anything about it except that they will be fun during the concert. And it was! They lit up and blinked during certain songs. The effect in Rogers Arena was mesmerizing. So pretty! I had an amazing time at the concert. It was an experience to see how the professional photographers work at these sort of events. 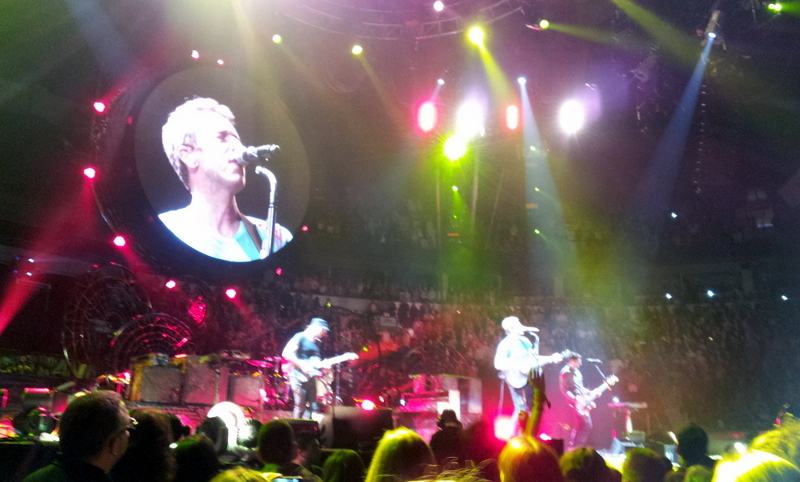 The music was awesome and I enjoyed seeing Coldplay up close! Thank you Dose.ca! Disclaimer: I had won a contest from Dose.ca to attend this concert. The opinions expressed in this post are entirely my own and have not been influenced in any other way.